Design beginners often face a lot of unknowns while learning UX Design especially when it comes to deciding on the roadmap. Hence, this small Roundup with industry experts is a small effort which might act as a guiding light for them. And here is the question format. Q1) Which one of these is best suitable for a design beginner to go with when it comes to learning UX Design? 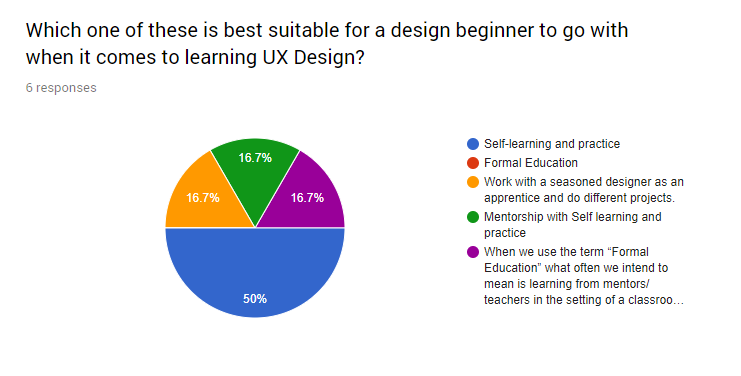 Q2) Your recommended way for a UX Design beginner to learn UX? 6 industry experts answered these questions so, here is what they have to say based on their experiences. Expert Musings on how to learn UX for beginners? A1) Other: When we use the term “Formal Education” what often we intend to mean is learning from mentors/teachers in the setting of a classroom following a definite curriculum. In today’s world, none of these is limited to a college. Find a mentor in your office, social media or anywhere you can. Meetups, short training, seminars, webinars can be your classroom. The curriculum you can make of your own or see what all you need to learn to reach where you want to be. A “Formal education” might be able to get you a head start of a few miles but to run the long race you have to practice self-learning (which is a function of self-discipline). Even people who get a formal education do that. So if the situation allows and you are willing, go for a formal education. Else, world’s knowledge is at your disposal if you have the discipline and the curiosity to learn from it. A2) Read more and more. Do more and more. Reading more will connect you to great people (Mentors) and great resources (Curriculum) and great ideas. Doing more will help you make use of what you read and learn. Education without application is of no use. Apply, make mistakes, learn from them, apply again. The more often you do this iteration, the closer you get to mastery. A3) Interaction Design Foundation, Toptal and various YouTube channel are good like The Futur. Visual designers especially, just don’t browse dribbble and Behance but try to replicate what you like. Also remember, there are a million opinions out there so experiment with what you learn and see if it fits in the real world scenarios. Also, different people resonate with diff. learning platforms like reading versus watching or a mix. Try and figure out, slowly you would build your own preferred and trusted set of resources which are tested with time. So get excited and get exploring! A2) In addition to the usual recommendations like ‘finding a mentor’, ‘reading design books’, ‘going to design meetups’. I highly recommend you to work on side projects. Side projects can be anything that you really love to do. Next is to frame your side project as a ‘Design Problem’. For example – If you are thinking of starting a blog on “Daily Inspirations” Frame this project as a design problem like – “How to make an online repository of things that people find really valuable?” Then dig deep into it. Like – What really inspires people? What really wakes them up? A1) Other: Work with a seasoned designer as an apprentice and do different projects. A2) Get a roadmap and continue learning aspect by aspect. Exposure, Experience, Expertise are the stages of learning. A3) Have a blog on just the list of books, courses, and blogs. Read here. A1) Other: Mentorship with Self-learning and practice. A2) – Design Experiences across the internet. Whenever the person faces an annoying UX, try to solve it on your own. – Read about good UX vs bad UX. A3) Design of everyday things by Don Norman, nngroup.com, IDF courses. Some good design courses at Designboat UI/UX School. A2) My very first recommendation is about you as a UX designer needs to develop your soft skills because part of our work is to interact with users and understand their needs. So you need to empathize with them. The second one recommendation is about to learn Visual Design and Psychology at least some basis. The third recommendation is to develop a high detail sense, and the ability to solve problems. A3) Interaction Design Foundation is a good starting point. A2) Learn and build your portfolio under the mentorship of experienced UX Designers. Personally, what I have learned is that learn and practice, that’s how you get there. No matter, you go with self-learning or some design school or to some mentor, unless and until you won’t practice, you won’t be able to make it. The following quote fits in perfectly with this learning. Do share your thoughts on what you learned through this expert roundup on recommended ways of learning UX. Thank you for stopping by and reading till here. Do share and spread the word. Aayushman UR brief and precise to the point. I appreciate. Great going. Yeah, he was spot on with his wisdom. Nice going buddy. Its really cool.